Hipmomma will put Maddie in "Style"
but I know she will appreciate the wear in a year or so. She is a little peanut, so she may be closer to 3 when she gets to wear these. Thanks HIPMOMMA for being so generous with giving this gift! You were so prompt with sending it to me, too! Thanks so much!! :) You made my day! She even sent me a thank you card for participating! Isn't that kind? So thoughtful! Rene Gutteridge is the author of Boo Humbug. What do you think the book is about? To me, it sounds like a mixture of holidays...Halloween and Christmas (the Grinch). This book is not about that, though. This book is #4 out of the series. The setting is Skary, Indiana, and it is Christmastime. One of the main characters, Lois Stepaphanopolis attempts to bring her demented and horrifying vision of A Christmas Carol to life. Lois tries to rally her cast, but they aren't too sure of her. She finds out that her marketing director, Alfred Tennison, is an old Scrooge himself! The storyline has many interesting turns as it unfolds. The cast goes through a major disaster...which makes any reader laugh out loud! Lois panics when she discovers that her marketing director is a huge Christmas Scrooge and that the audience has been promised the real Christmas story and not Dickens’ A Christmas Carol! Can the actors pull off making things work and convince their community to embrace the true meaning of Christmas? The pages turn quickly with this read, because Renee keeps your interest. It will baffle you, and give you humor. She will surprise you with her ending, though...you will be blessed with the message of Christmas. Be sure to check out Boo Humbug for this Christmas time read! I hope we get dumped on this year! I have a feeling that Madelyn's new Independence with crawling will soon move to walking. Today she was crawling around downstairs. Well, that little sweetie pulled herself up to stand up to the bottom step. She is such a peanut! It would be kind of comical if she was an early walker! That would be pretty funny. A little gal in our church, who is only about 3 weeks older than Maddie, just started walking....so, she could walk early. There is less things to worry about with a walker than a crawler. What do you think?? I want to win this book from Karen's blog: Surviving Motherhood. Madelyn is now on the mission of getting were she wants...and fast! She is crawling at 7 1/2 months old. She is so incredibly adorable! I love when babies start to crawl...walk...reach for you...etc. All those new milestones are fun, but usually require more work. 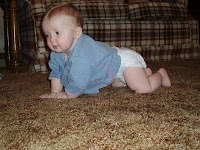 She thinks it is just great that she is crawling! Both little ones are sick today. It started yesterday with the runny noses. Caleb has a good cough going on. Last night was a rough night in our home. Maddie was up almost every hour just being miserable. She pretty much was attached to me all night (like a leech to a foot)...that is how I felt anyway. I guess you just need to do that once in awhile. Caleb was calling for me almost every hour from 2:30 on. I couldn't do both kiddos, though...so, my darling hubby was in there a lot, when finally he just went in there and slept with him at 5 am- ish. I am really bummed that I missed church today. It was youth Sunday (where the youth lead it). I love these Sundays, because they do such a great job! My friend Lisa's little boy turned 1 yesterday. He is so adorable. I can't believe he is 1 already! Wow, time flies! He is having a party today, and I am going to miss it...and I am sad. The time is drawing near for winter to come. I love fall...the vibrant colors, smells, cooler and crisp air, bon fires, wood stove burning, etc. 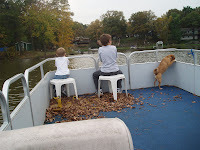 We had fun riding in the pontoon the "last time" for this year before we took it out. 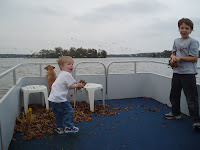 The boys were having fun throwing the leaves at each other. With the wind at their backs the leaves hit Terry and I...and you know that was hilarious! We really had a blast chasing the sea gulls. I am surprised that they didn't all team up and bomb us from the air with their ammo. (white poo). I know if I was a sea gull and people chased me with a boat, I would nail them! My boys are being funny with this picture...Money see, Monkey do! Little Miss Maddie loves the boat and being out doors. 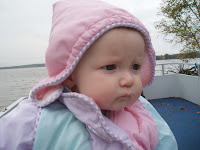 We bundled her up that day with the winds as cool as they were. Thursday's Thirteen...I want this, can you help? I would love to win this for Maddie...do you think you could help me out? Pinks&Blues is having a contest for an awesome Baby Girly-Girl Giveaway....total retail value of $205!! And to tote all of your lucky baby girl’s gifts? 9. Become a subscriber to Pinks&Blues lucky loop. With th Lucky loop you get your daily fix of trendy, ultra-hip and unforgettable gift, personal, travel, creative, seasonal, age-, gender- and species-specific ideas. Each day is something different: Monday is our Preconception related pick; Tuesday is our Mama pick; Wednesday is our Baby pick; Thursday is our Kid pick; Friday is our Dad pick; Saturday is our Grandparent pick; Sunday is our Pet pick. 10. If you subscribe, please send an email to pinksandblues[at]gmail[dot]com indicating that I sent you....Sassyfrazz. 11. Every friend I refer who becomes a Pinks & Blues Lucky Loop subscriber, you’ll automatically get an extra chance to win! 13. All new subscribers will be entered into the contest and be eligible for the extra “referral” entries as well! The drawing will take place on Monday, November 5, 2007 at 5 PM EST! 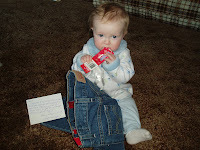 From dates to diapers contest is asking what our favorite cake was growing up. Our family has a traditional "Salad dressing cake" that is a huge hit every birthday. It is a Chocolate chip Chocolate cake...and it is amazingly yummy! The mayo is what makes it so moist. I will try to post the recipe on here later because I think everyone should at least give it a "scout size" taste (see post about Mean Mom). What your favorite birthday cake? Is it a traditional cake, or would you rather have a pie or cobbler? Inquiring minds would like to know! Go over to her contest and check it out! Wish her twins Happy Birthday, too! Sift dry ingredients. Add salad dressing, hot water and vanilla. Do not over beat. Bake in a moderate oven at 350 degrees for 30 minutes. Topping: Sprinkle chocolate chips over cake before baking, or make Brown Sugar Frosting. Our family likes the cake sprinkled with chocolate chips. Melt butter and add brown sugar. Add milk and boil 1 minute. Add powdered sugar until is spreads nicely and cover cake. You really need to try it~ It is so good, and you will be happy you tried it! TRUST ME...Yum!! 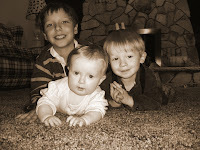 MomsBlogging is having a contest for who is the meanest mom! :) I think this contest is really funny, because in a way, we as moms are all mean (in our children's eyes). All entries must be in by October 31st at midnight EST and she will announce the winner on Friday, November 3rd. I think I am the meanest mom, because I make my children take a "Scout size" bite of everything I make. I don't like the, "I don't like it" statement when they haven't even tasted it. I mean really, it could be the best thing they ever tasted...they should at least try it, right? I will not make them finish what is on their plates, but if they dish it up themselves, then I will. They need to control what is put on the plate. They always have the option to get more if they want. This is funny, because sometimes Nathaniel will make 3-4 trips. If the kids don't eat their supper, they aren't allowed to have ice cream for a snack later. Our family usually has ice cream at night...so this is a treat. Sometimes I get the crying for ice cream, but I just say, "Sorry, you didn't eat your supper." My son is great about forgetting to put his socks on in the morning (school days) and I have told him many times that the socks are included with getting dressed. Well, he had a new play station game for his birthday, and he was really excited to play it the next day. I had made a rule that he will have play station taken away if he forgot his socks. Well, what do you think happened? Yes, he forgot, and I felt bad about taking it away...but I have to follow through. I make my kids wear coats when it is chilly outside, and hats on their heads. I make my kids go to bed almost the same time every night! I make my son study his spelling words everyday (spelling isn't his strong point) and do reading everyday. I make our children clean up their toys. I make our kids clear their dishes when done eating (starting at age 2). I give them chores to do, and require daily duties to be done. I teach my kids how to make their own meals now and then. I can be a slave driver at times with getting the cleaning tasks completed. Puppy Chow for the sweet tooth! It must have some nutrition, too, because there is peanut butter in there for protein. Mexican Dip: Veggies...now this is nutritious! Mix together :8 oz. softened cream cheese, 8 oz. sour cream, 3/4 taco seasoning and place on bottom of pan. Top with lettuce, black olives, onions, tomatoes, and cheese. Serve with tortilla chips or scoops. Mix together cereal, nuts, pretzels, and candy in a large container. Melt Chocolate chips and oil in the microwave. Pour over mix and stir until it is coated. Pour onto wax paper and let it dry. Store in air tight container. These are just a few of my favorites. What are yours? You can post them on your blog and enter yourself in a contest! Just leave a comment here on this post, before Saturday evening, telling her what your favorite party foods are. Link to this giveaway, anytime before Saturday evening. To make it fun, you can even post pictures, or a recipe! On Saturday, she will randomly choose the winner of a special gift. Win a Rockin' Baby Sling! Mamanista is having a contest for a sling give away! Rockin' Baby is originally known for their ring slings and they are giving the gorgeous "Suffragette City" ($102 value) to give away to one lucky reader. This sling has a sweetly chic sage and pink butterfly pattern on one side and a hot pink fabric with silver trim on the reverse. The fabric is a delicious, breathable, 100% cotton and the ring slings are held to a high standard of safety--each ring must pass an impact test and a 250 pound pull test before being considered ready to ship. If you are a blogger, link to this post to let your readers know about the contest. If you are not a blogger, fill out this form to share this contest with two friends. If you have trouble with the form, just e-mail two friends the link to this post and Cc mamanista@gmail.com. They will not share your e-mail or your friends' e-mails with anyone. Make sure you comment on the post AND link or share. Contest ends: November 13, 2007 at 11:59 PM EST. A. B. Baby Boutique is giving away the My Little Crayon Roll-Up in the Classic Stripe Style to one lucky reader! Simply post this giveaway on your website or blog and reply to this post with your name and link to the post! It is that easy! One winner will be drawn on Thursday, November 1st! Link must be present until the winner is announced! Win the game: MAN LAWS AND WOMAN RULES. Man Laws and Woman Rules is a game of life's unwritten laws. There are certain and separate bi-laws that men and women follow in life. These statutes have never been written down but are still binding. Most have been taught these rules since childhood. This is a game that will identify which men follow the "man laws" and which women follow the "women rules", and just how ridiculous each of the sexes think the other is for doing so! This is a conversation game for 2 or more players ages 17 and up. To win this wonderful game (retail value $24.95), write your own Man Law or Woman Rule: Here is mine: Women wipe their kids faces with their finger moistened with saliva, and men spit out the window while driving. Post your rule on your blog, linking back to this post. Then leave a comment letting her know you want to be entered. Wow! 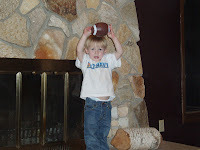 I can't believe it was 9 years tonight that my first baby was put in my arms. He really changed my life! I couldn't believe that I was a mom! I was 23 years old when I became his momma~ and I was going to be a single mom. I grew up in a Christian home, and my parents raised me with strong morals. If you told me that I would have been a single mom at age 23, I would have told you that was crazy! Well, after Bible College, I decided to live life how I wanted to. Out of my selfishness God really blessed me way above what I deserved. Aren't we all glad we don't get what we really deserve? God's grace is so amazing. Nathaniel's Dad isn't a Christian. This has been hard for Nathaniel (and me). God has put such a missionary heart in Nathaniel, and he worries for his Dad. He has cried over him with knowing that he is lost without Jesus. I pray that Nathaniel will keep that missionary heart, and pour the prayer over his Dad. When Nathaniel was littler he always asked the clerks in the stores if they knew Jesus. It used to make me embarrassed. Why should I be embarrassed of our Lord? Isn't amazing what children teach us? Through the mouths of babes....I think children faith is so big and pure...and they see things more clearly sometimes. They are truly wonderful! We can learn so much from them! Nathaniel means "Gift from God." That is why I named him that. At age 2, he would tell people that he was a gift from God. It was pure precious! He was such a happy, and easy going baby. For that, I was really blessed, too! One really funny thing that Nathaniel said when he was a toddler was that he called his knee his leg elbow. When he was about 2 1/2, he said Jesus was in his heart. This is one of my favorite stories of Nathaniel's. We were driving and Nathaniel said Jesus was here. I said where, and he said he was on the seat next to him. I said that was good. Then, Nathaniel said he is in my heart, too. OH...talk about an instant avalanche of tears! Wow~ heart gripping. After that he always buckled Jesus in next to him. Nathaniel has such a tender heart. He is a great cuddler, and snuggler. He really knows how to make people feel good. He somehow knows right when I need that hug, or a compliment. God has truly blessed me with a wonderful little man. I love you Nathaniel! I pray that you will honor God with all you do, and that you will Follow HIM your whole life! Thank you for being my sweet son! Sharing some scripture...Encourage others and yourself! 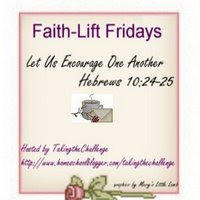 Share a scripture, quote, devotional, lyrics, or anything that has blessed you and strengthened you in your faith.Don't forget to grab the button and to link back to Sheryl's post. Leviticus 19:18 "Do not seek revenge or bear a grudge against one of your people, but love your neighbor as yourself. I am the LORD." Deuteronomy 4:29 "But if from there you seek the LORD your God, you will find him if you look for him with all your heart and with all your soul." 1 Chronicles 22:19 "Now devote your heart and soul to seeking the LORD your God. Begin to build the sanctuary of the LORD God, so that you may bring the ark of the covenant of the LORD and the sacred articles belonging to God into the temple that will be built for the Name of the LORD." 2 Chronicles 12:14 "He did evil because he had not set his heart on seeking the LORD." Romans 2:8 "But for those who are self-seeking and who reject the truth and follow evil, there will be wrath and anger." 1 Peter 2:21 "To this you were called, because Christ suffered for you, leaving you an example, that you should follow in his steps." 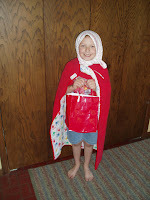 K C gave me this treat when I visited her blog yesterday with Thursday's Thirteen. Hootin' Anni started this treat give-away...and she gave me her little treat, too. 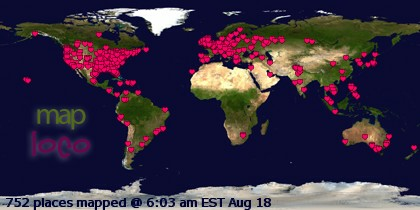 Share the love with random visitors on your blog...make a friend! 1. 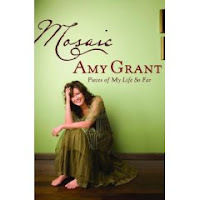 Amy Grant weaves original lyrics and poetry into a narrative patchwork of timeless candor in Mosaic. Gives down-to-earth insight from her celebrity stardom, she invites you into her world and gently leads you to fresh insights about your own. Amy started her career and fame in the music industry with a part-time job sweeping up a Nashville music studio, which was the perfect opportunity to duplicate a tape of her original songs as a gift to her family. A studio executive heard her recordings and she really soared into the music world from there. She displays photos of her immediate family (Mom, Dad, 3 sisters and herself), Great Grandma, High School Photo (1978), classmates, her 4 children and 1 step-daughter, hubby: Vince Gill, her favorite writing spot, tour photos, Minnie Pearl (from Hee Haw), and other memorable events with famous people/events. Words to many of her well known songs, written as a poem. She took the words of the songs from pieces of her life. She gives you the history behind the songs she sang, lyrics she wrote. Her and Vince Gill were baptized together...and the song correlated with that special event. Millie, her daughter, is named after Minnie Pearl...from Hee Haw! She is a woman who has weathered some storms, and with God, she was carried through. I think some of her songs, when you know the history of them, touch you even more. I think this book is a great read to really know who Amy Grant is and who God is in her. She does a great job revealing life through music. Thank you Amy! You can purchase Amy's book: Mosaic here. We were driving the other day, when Caleb said, "Grandma is going to buy me princess underwear when I go potty." I told him it wasn't princess underwear, but it was Thomas underwear. He said, "Why cuz?" I told him that princess underwear was for girls, and maybe Maddie will wear them when she is bigger. He said, "I am a boy. 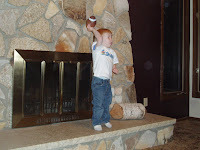 When I get bigger I will play football with my friends!" Yea~ He got it! Mom4Life is having a month long of contests (4 weeks total) to celebrate Heather's birthday! This is starting week 2! Go check it out! I need to get my entry in yet...hopefully tomorrow! She has super products offered on her site! Go check it out, and wish her a Happy Birthday! AND~ She is Pregnant...so give her a big congrats! Whoo who! Simply Sweet Bowtique, has provided a set of two holiday red bows as a prize for one of you. Laura is helping with this contest and she gives you an option for a second entry! I love the Grinch clip and the 4th of July clips. They are really adorable, and I know Maddie would look so cute in the clips! Go check it out! Contest ends October 19th at Noon, EST. Rocks in my dryer is having a Big Bloggy giveaway! The Fall, Y'all Bloggy Giveaway is simply a carnival. You host a giveaway at your own blog, for anything you like--something you've made, something you've bought, etc. Be creative! Make it something that is reflective of you. Go here to check out all the details. They are also having two other contests: Chocolate Cake Club ends 10/15. Warm Biscuit ends 10/14. MomsMenu.com is holding a giveaway for some great prizes! You could win $100 to Home Depot or one of the following DVDs:Veggie Tales - The Wonderful Wizards of Ha’sKappa Mikey - Lost in TransportationPhonics for Babies: Baby’s First WordsTo enter, just subscribe to one of their newsletters. Ends October 31, 2007. 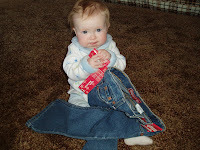 Adventures of a Twenty-something Motheris giving away a pair of Babylegs! Enter by October 15th. 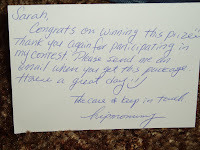 Also, she is having a Kozypal Contest Prize: $25 gift certificate to KozyPals. To enter, leave her a comment with a link to your favorite design of KozyPals. Contest ends October 31st! Doodlebug Prints is offering a lucky Pinks & Blues reader 50 free announcements/invitations (approx. $100 value!) in a design of your choice (baby, birthday, holiday, etc.)! Ends October 16. The makers of the great party game, Quelf, gave Lisa: 3 shirts, a hat, and a pair of boys underwear with characters from their games on them to give away on her blog in celebration of Barnes and Noble offering Quelf on their website. Check out the 5 items from Wiggitybang! In addition, if 5 people buy Quelf from Barnes and Noble through that link, she will hold another give away for their game Quao. My friends and I just played this game last night, and it was pretty fun. Ends October 31st. She is also giving away an autographed copy of the book Love Letters to a Child by Tracey Fink, the book is about writing a journal for your child. Ends October 14th. Win a copy of the new “Go Diego, Go Safari Rescue” movie from Parent Product Reviews To enter, leave a comment by 5pm, Monday October 15th and you’ll be entered to win one of FIVE copies! The Luv Mutt Halloween Costume Contest Prize: $25 gift certificate. Deadline to enter is October 31. The Mom Blogs is giving away Free Martian Child Movie Tickets! 10 People will Win. Giveaway will end October 27th. There is a Breast Cancer Awareness Month Contestgoing on over at The U.B. Buzzzzz… You have TWO chances to win a bottle of “Pink Hope” lotion. Ends October 30. Blessed Nest is sponsoring a October give away in honor of Breast Cancer Awareness. Spoon Sisters go PINK! Spoon Sisters helped with this contest with their products (all sporting the pink color). There are different prize packages...so go on over to Blessed Nest and check it out. Contest ends November 7th at midnight. Christine is turning 30! She is celebrating by giving away a gift a day during her birthday week, October 21 - 27, and they are great prizes! Votive candles, ribbon hair bows, a personalized cd, no-slip-clips, an adorable item from Avannabel Baby, gloves in a bottle, and a 1yr subscription to Tessy and Tab reading club! MyLilVentureis having a cool give-away of One Set of Protect Your Sleep bed encasement which consist of 1 Queen size mattress and two pillow en casements from CleanRest. Contest closes on October 31st. Baby Candy is giving a lucky Pinks & Blues reader a $45 dollar gift certificate, which will cover two customized onesies, including shipping costs! Ends October 17. Win 50 Doodlebug Prints at Mamma Loves Giveaways! October 16. 1. 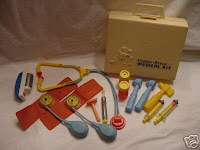 You had that Fisher Price Doctor's Kit with a stethoscope that actually worked. 2. You owned a bicycle with a banana seat and a plastic basket with flowers on it. 4. You had either a "bowl cut" or "pixie", not to mention the "Dorothy Hamill". People sometimes thought you were a boy. 5. You had rubber boots for rainy days and Moon boots for snowy days. 6. YEAH! You owned a "Slip-n-Slide", on which you injured yourself on a sprinkler head more than once. 7. You owned "Klick-Klacks" and smacked yourself in the face more than once ! 8. Your Holly Hobbie sleeping bag was your most prized possession. 9. You wore a poncho, gauchos, and knickers. 10. 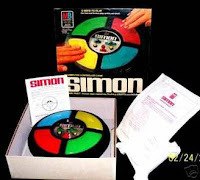 You begged Santa for the electronic game, Simon. 11. You had the Donnie and Marie dolls with those pink and purple satiny shredded outfits, or the sunshine family. 12. You spent hours in your backyard on your metal swing set with the trapeze. The swing set tipped over at least once. 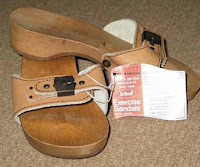 You had a pair of Doctor Scholl's sandals (the ones with hard sole & the buckle). You also had a pair of salt-water sandals. and you despised Nellie Oleson! You wanted your first kiss to be at a roller rink! Your hairstyle was described as having "wings" or "feathers" and you kept it "pretty"
with the comb you kept in your back pocket. You know who Strawberry Shortcake is, as well as her friends, Blueberry Muffin and Huckleberry Pie. You carried a Muppets lunch box to school and it was metal, not plastic. With the thermos inside some were glass inside and broke the first time you dropped them. "I am 7 months old!" More contests to check out! "Coupons, Coupons...get your online coupons at..."coupon codes! Who knew that saving money while shopping online could be so easy as a click of the mouse? Do you like to shop online? It is so fun, and stress-free. Why not save money while you shop? UltimateCoupons.com offer tons of great online coupons for hundreds of online merchants to help you get free shipping or dollars off your regular purchases. Have you heard of the new Win a Nintendo Wii? I just played this last night at some friend's house, and it was so fun! I would love to have this game! You can work up a sweat playing the video games! You can Win a Nintendo Wii from their coupon blog : EverybodyLovesCoupons. Contest ends October 31, 2007 at 11:59pm ET! 7 oz Gloves in a Bottle review coming soon! personalized CD or book - Made Just For Me review coming soon! an adorable item from Avannabel Baby review coming soon! 1-year subscription to The Tessy and Tab Reading Club review coming soon! is celebrating her birthday by having The MONTH of giveaways. This week on her blog she is giving away a ton of great items valued over $442.27! In fact, this whole month will be filed with special giveaways valued at over $1,450.00! Click here to view them all in detail. Lisa is giving away a signed copy of Love Letters to a Child: A Resource for Parents and Grandparents to one lucky random winner. To enter, stop by Our Seven Qtpies before October 14th. October is Breast Cancer Awareness!! 5 Minutes for Mom is giving away a pink EX-Z75, a 7.2 megapixel digital camera which is part of Casio’s highly-regarded zoom line of EXILIM cameras, it has a special camera case and pink-ribbon lanyard for the month of October. They will draw the winner on Friday, October 26th. Visit the National Breast Cancer Foundation and the Breast Cancer Site for more information about how you can help promote awareness. Pinks&Blues is giving away a BabyDish Hally Bag Pink Ribbon Diaper Bag Survival Kit in honor of Breast Cancer Awareness month at Mama loves giveaways. Enter by October 31st at 5 PM EDT. iMommies is giving away a FREE iPod! to celebrate Breast Cancer Awareness! This contest ends November 1st! The winner will receive one brand new, hot pink, 1 GB Apple iPod Shuffle. Sign up for their e-letter to enter! Amanda is having a Surprise Halloween Giveaway. To enter, just write about the contest at your site then let her know you’re participating via comments. Contest ends October 10th. Homemom3 is giving out a brand new, still in the packaging Word World DVD. Caleb and I really enjoy watching this entertaining and educational cartoon! I love the characters! Here are the rules of the contest: Sign Mr. Linky- Comment on her post telling her you want to win.- Blog about this giveaway and link to Word World. The giveaway ends midnight on October 15th. She is in hiding... Welcome Madelyn! 5 minutes for Mom is having a Cyber Baby Shower. This picture is of me just after I delivered Maddie. She was a special baby to us for many reasons. She is my baby after our other baby went to heaven. So, Maddie is very special. I had very little amniotic fluid left according to the ultrasound on my due date, so they needed to get things moving. I went in that night to the hospital, and they put a pill in the nook of my cervix. Well, that really got things moving and about 4 1/2 hours later, my sweet pea was born. I did have an epidural, and she didn't respond well to that. I was hooked up to oxygen and needed to keep flipping from side to side. I was the biggest I ever was with pregnancies, so I was expecting a 9 1/2-10 pond baby. When I started pushing, it burned like fire down there...well, come to find out she was posterior (so she was sunny side up). Luckily she had a little mellon, so it wasn't too bad. When she came out, of coarse I was emotional, and the Dr. asked me how big I thought she was. I said, "Oh, 8 pounds?" The Nurse said, "No, she is little, she is more like 7 pounds." My best friend, Randi, was in there, and she took a guess at 6 pounds 8 ounces. Randi knows her baby weights, because Maddie clocked in at 6 pounds 9 1/2 ounces! What a little peanut! 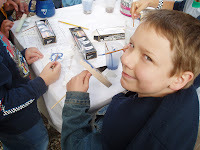 That was a new experience for me, because both my boys were over 8. 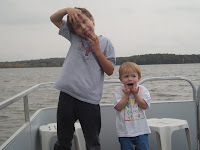 Nathaniel was 8 1/2, and Caleb was almost #9! Her go home outfit didn't fit her until she was 3 months old. What a miracle she is! Christian Toys For Boys and Girls - Tales of Glory Nativity Set . Mom 4 Life - will provide one $25 gift certificate to their online store that features 100% Mom invented products and they provide free shipping for orders in the US. Signing Time! - is giving away 2 Baby Signing Time! Gift Sets! Mom4Life is having an amazing month long contest going on. 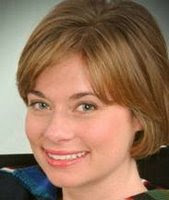 Heather is celebrating her birthday this month (October 5th) and so she is having 4 big contests valuing over $1425.00!! You can check out what week it is and enter for that week with the details. You can enter ahead of time, too. Here is where all the details of the contest are at, and some of the questions you may have answered. Items in the Week One giveaway have a retail value of $429.48! 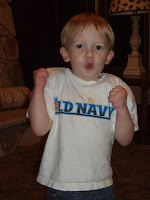 Win An Old Navy Boys Medium Knit Shirt in Army Green. It has an logo on the front that has army characters on it. Just fill in the Mr. Linky on this post and then link to this contest in a post on your blog before Friday, October 5th, 11 PM (CST.) If you don’t have a blog, still enter your name in the Mr. Linky and please email your friends to tell them about the Giveaway. To Enter, leave a comment on this post and If you BLOG... write a BLOG post about this give-away as well as link to KANGAROODLE.If you don't blog just leave your email address in a comment. Deadline to enter is Saturday, October 6th. La Chica Chic is giving one Fashion Fling reader a chance to win this gorgeous Monica Bag (a $129 value). All you have to do is leave a comment at Fling Reader! This contest ends October 5th. Boutique Cafe & Philips have teamed up together to bring you the “Family Photo Contest”. Enter to win one of 4 spectacular Philips Digital Photo Frames in their gorgeous seasonal design! To enter, submit a photo of your family in action! The Newest Giveaway! Playskool Baby Care from Cool Moms Rule! How to Enter Today's Giveaway:1. Write a post on your blog linking back to THIS contest. *Remember, Cool Moms Rule is giving a new prize away every day for a week in honor of our new feature, Book Reviews! You can come back every day and enter all of our giveaways!2. Leave a comment on THIS post with your link and your email included. *Don't have a blog? No problem! Just leave your comment with your email to be entered in today's giveaway. Don't forget to tell your friends about Cool Moms Rule! and our week of giveaways! Pinks&Blues giving two lucky readers their own cool Buff Headwear. Contest ends Friday, October 5, 2007 at 5 PM EDT. Enter to win a $50 Gift Certificate to In The Pink Designs, leave a comment here telling them what piece on the In The Pink Designs site you would put the $50 gift certificate toward if you won! This contest ends Tuesday, October 2, 2007 at 5 PM EDT. They are giving away a Pinks & BOOs Halloween GIVEAWAY package (a total retail value of $217.00!) Check out this post, and contest ends Monday, October 15, 2007 at 5 PM EDT. Opinionated is having a contest to win a copy of Elephant Dance: A Journey to India written by Theresa Heine, illustrated by Sheila Moxley, and published by Barefoot Books. You must enter by October 3rd! Pamela, a mom-entrepreneur who owns a great store called Happy Panda, graciously offered to throw a “Cyber Baby Shower” at 5 minutes for mom. *Insert from blog: First, we’ll play a few shower games that you can have fun with on your own blog and try to win some prizes. We’ll suggest some questions that you can run with on your blog to create a fun party post. After you have written your post, you can sign the Mr. Linky at the bottom of this post so that others can come by and visit your party post. Second, we’ll take a look at all the adorable gifts we received. We are so incredibly thankful to have received such beautiful gifts from some of the best companies online. Third, you can leave a comment on this post to enter yourself in the draw for the rest of the prizes. Prizes will be announced October 5th. Fourth, you can cruise through the Mr. Linky and visit the other blog parties and meet some new friends and have fun!